Airborne laser scanning (ALS) has emerged as one of the most promising remote sensing technologies to provide data for research and operational applications in a wide range of disciplines related to management of forest ecosystems. 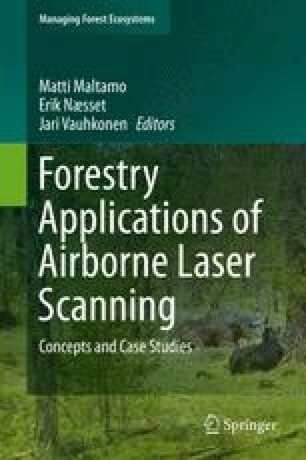 This chapter starts with a brief historical overview of the early forest-related research on airborne Light Detection and Ranging which was first mentioned in the literature in the mid-1960s. The early applications of ALS in the mid-1990s are also reviewed. The two fundamental approaches to use of ALS in forestry applications are presented – the area-based approach and the single-tree approach. Many of the remaining chapters rest upon this basic description of these two approaches. Finally, a brief introduction to the broad range of forestry applications of ALS is given and references are provided to individual chapters that treat the different topics in more depth. Most chapters include detailed reviews of previous research and the state-of-the-art in the various topic areas. Thus, this book provides a unique collection of in-depth reviews and overviews of the research and application of ALS in a broad range of forest-related disciplines.